The large yellow athey wagon at the Mining Heritage Park is a unique piece of mining engineering. 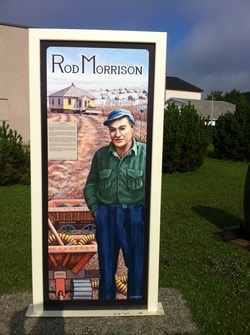 Rod Morrison was a one of a kind master mechanic and dedicated Algoma Ore employee. Their respective stories are a perfect match. Especially when their stories combine in the perfect marriage of ingenuity and hard work to the benefit of Wawa residents. The results of Mr. Morrison's creativity and customization of the abandoned athey wagons, will always be visble in the 52 Sinterville homes appreciated by their current and future occupants.